http://www.JewishWorldReview.com | Should the United States be the world's policeman? According to a new Rasmussen poll, only a narrow sliver of US voters -- 11 percent -- want America to be the nation chiefly responsible for policing the planet and trying to maintain international order. An overwhelming 74 percent reject the idea. These aren't anomalous results. When Rasmussen polled the same question in 2009, the results were virtually identical. Gallup regularly asks how large a role -- leading, major, minor, or none -- the United States should take in solving international problems; only a small minority of respondents ever favors the "leading" role. America may be the world's "indispensable nation," as Bill Clinton said in his Second Inaugural Address, but most Americans, most of the time, are uncomfortable with the idea of US global hegemony. John Quincy Adams wrote long ago that America "goes not abroad in search of monsters to destroy." As the polls consistently suggest, that isolationist sentiment still resonates strongly. But in Adams's day America was not the mightiest, wealthiest, and most influential nation on the face of the earth. Today it is. The United States is the world's only superpower, and if we shirk the role of global policeman, no one else will fill it. By nature Americans are not warmongering empire-builders; their uneasiness about dominating other countries reflects a national modesty that in many ways is admirable -- and that belies the caricature of Uncle Sam as arrogant bully or "great Satan." Nazi Germany had conquered half of Europe and Japan was brutalizing much of Asia by the time America finally entered World War II. If America hadn't rescued Kuwait from Saddam Hussein in 1990, no one else would have, either. If America hadn't led NATO in halting Serbia's ethnic cleansing in Kosovo, no one else would have, either. If America hadn't faced down the Soviet Union during the long years of the Cold War, no one else would have, either -- and hundreds of millions of human beings might still be trapped behind the Iron Curtain. 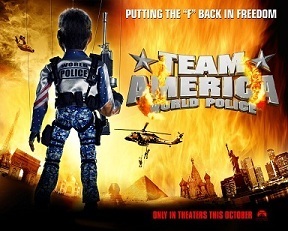 There is no realistic alternative to America as the world's policeman. It clearly isn't a job the United Nations can do. Can an organization that makes no distinction between tyranny and democracy rein in the world's monsters? As the UN's bloody trail of failure from Bosnia to Somalia to Rwanda makes clear, UN "peacekeeping" offers no protection against predators. None of this is to say that America-as-Globocop is a perfect solution to the world's ills, nor that the United States hasn't made many grievous mistakes in its actions abroad. But as the historian Max Boot argues, "America's occasional missteps should not lead us to abdicate our indispensable role, any more than the NYPD should stop doing its vital work, simply because cops occasionally do the wrong thing. On balance, the NYPD still does far more good than harm, and so does the United States of America." To say that America must be the world's policeman is not to call for waging endless wars against all the world's bad actors. Police officers carry weapons, but they fire them only infrequently. The cops' main function is not to gun down criminals, but to suppress crime and reduce fear by patrolling the streets and maintaining a visible presence in the community. Similarly, a well-policed world is one with less combat, not more. The purpose of America's nuclear umbrella and its global network of military bases is not to foment war on all fronts, but to prevent it -- by deterring aggression, maintaining the flow of commerce, and upholding human rights. We don't do it perfectly, not by a long shot. We don't always live up to our own standards, we sometimes confuse police work with social work, and we are often rewarded not with thanks but with resentment. A policeman's lot is not a happy one. It is, however, an essential one. Our world needs a policeman. Whether most Americans like it or not, only their indispensable nation is fit for the job.